Found 8 file extension associations related to ArcPad and 8 file formats developed specifically for use with ArcPad. 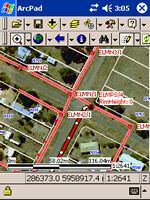 ArcPad is software for mobile GIS and field mapping applications using handheld and mobile devices. ArcPad provides field-based personnel with the ability to capture, analyze, and display geographic information, without the use of costly and outdated paper map books. If you need more information please contact the developers of ArcPad (Esri), or check out their product website.